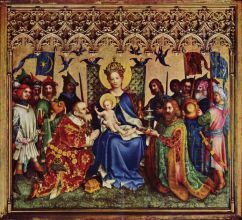 Stefan Lochner (Meersburg, 1400 – Cologne, 1452) was a German late Gothic painter. 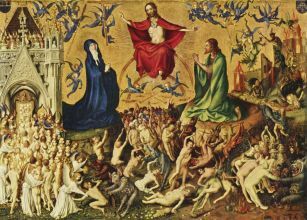 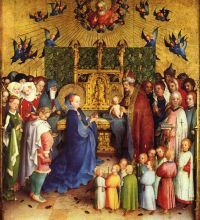 He worked mainly in Cologne, Germany, and his principal work is the triptych of the Altar of the City Patrons (done in the 1440s, which is in the Cologne Cathedral), which represents the city in homage to the infant Jesus. 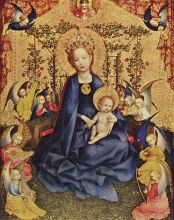 The epitome of his style is Madonna of the Rose Bower (c. 1450, housed in the Wallraf-Richartz Museum in Cologne), showing the Virgin and Child reposing in a blooming rose arbor and attended by Lochner's characteristic child Angels.